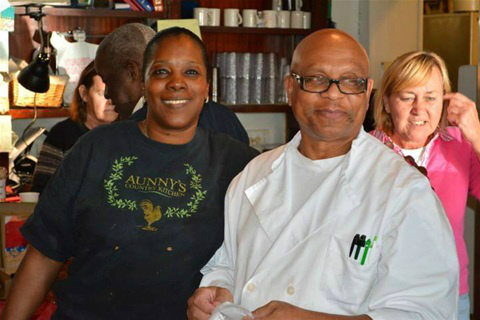 I enjoyed talking to and writing about my friend Barbara so much, I headed over to Aunny’s Restaurant on Front Street to talk with a couple more friends, Andrea and Charles Johnson, the owners and proprietors of Aunny’s. They have delicious country style meals on their menu - all homemade from scratch. When I want something tasty, nothing fancy, just down home cooking, I head over to Andrea’s. We sat in one of the booths talking and talking. Once again, it was a conversation I really enjoyed having. I adore Andrea. She is a very beautiful woman both on the inside and out. I have joked with her in the past that she’s my sister from another mother. She’s the black version of me and me the white version of her. We’re both mouthy and tend to speak before we think. Although Andrea was born in Georgetown, she grew up in New Jersey. She lived there from the age of seven until she was 25 then she eventually moved back to Georgetown. “I even went to the school that movie was made about,” she said of her experience of living in New Jersey. “Which movie would that be?” I asked. We talked a little bit about her children, her son Christopher, he’s in the military (go Chris!). Her daughter Janema is still in high school and she helps out mom in the restaurant a good bit. Andrea’s mother, Jane, also works full time there. She makes homemade pies and cakes that are absolutely out of this world! I strongly recommend a visit to Aunny’s if only for the delicious and tempting deserts Jane makes. After explaining what a blog was and what I was doing, Charles promptly took a seat and started talking. Charles, seven years older than his wife, talked about his mother, Sadie Johnson. She was a cake maker here in town. I vaguely remember Sadie from years past. When I, myself, first moved here to Georgetown, there was a fire at Winyah High School. Charles and I reminisced some about the fire and the effects it had on the town. We also discussed how Georgetown High School was born through that fire and how it ultimately united both schools: Howard and Winyah. “Would you like to hear a funny story?” Charles offers. He begins by telling me how, like my friend Barbara, he too grew up in the “white section” of town - the far end of Front Street. “We both did,” Andrea chimes in. “And you didn’t make the connection?” I asked Charles. “Do you feel like it was God’s calling for the two of you to be together?” I asked both of them. After all, the odds of them meeting in their tender youths, being separated all those years, and then later colliding into each other’s lives and becoming one. “Okay, go ahead and tell your story,” he concedes. “No, but I’m guessing you do,” I answer as I look over at a grinning Charles. “Yeah, but you’re not doing it every single day like he does,” she exclaims exasperated with her husband who is sitting there giggling. I could empathize with Charles though. There is no way I could work in that restaurant around all that good eating and Jane’s fabulous deserts and not have a bit of something every day. Andrea has always wanted to own her own restaurant. Charles has been very supportive of that dream, helping her build it, run it with her side-by-side, and keep it going. I think he deserves a slice of pound cake or pecan pie once in a while. One my favorite things about Aunny’s is Thanksgiving. Every year they play host to hundreds of Georgetonians and offer a free Thanksgiving meal. It’s their way of giving back to the community and showing their appreciation for our patronage. They are the only restaurant in Georgetown to offer that and give thanks in their own special way. Two of my brothers, Keith and Brian, came to visit one year for the holidays. I made it a point to stop in and introduce them to Andrea and Charles. We were on our way to my daughter’s for the holiday feast so we didn’t eat Thanksgiving at the restaurant but that didn’t stop us from having dessert first. Neither of us could resist a slice of sweet potato pie before heading out. As we wrap up our hour-long conversation, I begin to mentally piece together the story I’m going to write. I leave them with feelings of gladness. I had so much fun talking with Charles and Andrea. I’m blessed to know these two. Like all friends, we may not see each other every day but we know the other is there. At least, I certainly know where to find them if I start to miss them. Speaking of which: Jane has promised me a delicious millionaire pie during the summer months. See you at Aunny’s!